Antonie van Leeuwenhoek – Dutch businessman and scientist. A renowned scientist of the seventeenth century, Antonie van Leeuwenhoek was born in Delft, Dutch Republic, on 24 October 1632. On 4 November, he was baptized as Thonis. He was a Dutch businessman and scientist in the Golden Age of Dutch science and technology. A largely self-taught man in science, he is commonly known as “the Father of Microbiology”, and one of the first microscopists and microbiologists. Van Leeuwenhoek is best known for his pioneering work in microscopy and for his contributions toward the establishment of microbiology as a scientific discipline. Hailed as the ‘Father of Microbiology’ this talented biologist chanced upon scientific research by mere coincidence. Antonie was a young entrepreneur, who established his own linen business and in search of a high-quality magnifying lens, to be used for inspection of thread used in the linen ended up devising a new technique of creating lens which can provide magnification up to 500 times. Upon encouragement from a friend and physician Graaf, Antonie used the improved design of the microscope to make many significant discoveries, which laid the foundation for the evolution of microbiology. Beginning with identifying the first bacteria to describing the structure of RBC’s to the detailed study of a deadly disease he suffered from; this eminent scientist contributed to scientific advancement even in his death. A moderately educated owner of the textile business, he learned how to make his own unique microscopes which offered unparalleled magnification. Using these microscopes he made a number of crucially important scientific discoveries, including single-celled animals and plants, bacteria, and spermatozoa. His microscopy methods were so finely tuned that after he discovered bacteria, this type of organism would not be observed again by any other scientist for over 100 years. His researches on lower animals refuted the doctrine of spontaneous generation, and his observations helped lay the foundations for the sciences of bacteriology and protozoology. Raised in Delft, Dutch Republic, van Leeuwenhoek worked as a draper in his youth and founded his own shop in 1654. He became well recognized in municipal politics and developed an interest in lens making. In the 1670s, he started to explore microbial life with his microscope. This was one of the notable achievements of the Golden Age of Dutch exploration and discovery (c. 1590s–1720s). As more of his works began to get published his repertoire increased exponentially; he was visited by many eminent personalities throughout his lifetime which includes the likes of Russian Tsar Peter the Great, German philosopher Gottfried Wilhelm Leibniz and Prince William III of England. Though this expert lensman shared his findings with the public, he preferred to work alone and kept the technique of making high precision microscope a closely guarded secret until his death. Antonie Philips van Leeuwenhoek was On October 24, 1632, in the Delft city of Netherlands, this famous microbiologist was born to parents Philips Antonysz van Leeuwenhoek and Margaretha. At a young age, Leeuwenhoek lost his biological father. His mother later married painter Jacob Jansz Molijn. 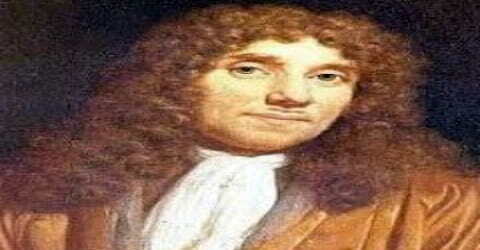 When his stepfather died in 1648, Leeuwenhoek was sent to Amsterdam to become an apprentice to a linen-draper. Returning to Delft when he was 20, he established himself as a draper and haberdasher. 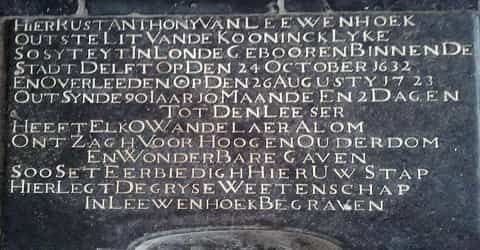 Antonie learned no languages other than Dutch, which suggests he was never expected to go to university: he would have needed to learn at least Latin for this. In 1660 Antonie received a lucrative job as Chamberlain for the assembly chamber of the Delft sheriffs in the city hall, a position which he would hold for almost 40 years. In 1669 he was appointed as a land surveyor by the court of Holland; at some time he combined it with another municipal job, being the official “wine-gauger” of Delft and in charge of the city wine imports and taxation. Antonie van Leeuwenhoek married Barbara de Mey in July 1654, with whom he fathered one surviving daughter, Maria (four other children died in infancy). That same year he returned to Delft, where he would live and study for the rest of his life. He opened a draper’s shop, which he ran throughout the 1650s. His wife died in 1666, Van Leeuwenhoek remarried to Cornelia Swalmius in 1671, with whom he had no children. His second wife died in 1694. Antonie was a very well-known figure in Delft and received a municipal title for the city’s sheriff’s assembly chamber, a position that he held for nearly 40 years. Antonie Van Leeuwenhoek’s religion was “Dutch Reformed” Calvinist. He often referred with reverence to the wonders God designed in making creatures great and small and believed that his discoveries were merely further proof of the wonder of creation. As the popularity of his linen store increased so did Antonie’s status in the society. He decided to utilize his new found fame to participate in the municipal politics. In 1660, he was granted the title of Chamberlain and in this capacity, he was in charge of managing the Delft sheriffs’ assembly chamber. Later he would hold the positions of surveyor and wine gauger. A man of many talents, Antonie was also appointed to supervise Delft’s wine trade and levy the appropriate taxes on imported wine. 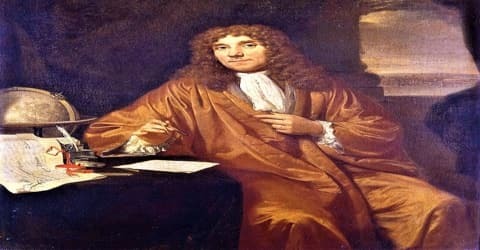 While running his shop and working for the city of Delft, Leeuwenhoek became a qualified land surveyor at about 40 years of age, just before he started his scientific work. Leeuwenhoek developed a fascination with lens-making while he was working at his shop. His interest in microscopes, as well as his knowledge of glass processing, resulted in a very significant and technical discovery in the field of science. He learned that he could place the middle part of a small rod of lime soda glass into a very hot flame and then pull the hot glass apart to make two long strands of glass. Then, he reinserted the end of one strand in the flame to make a small glass sphere that was of high quality. He found that the smallest lenses rendered the highest magnifications and these spheres soon became lenses for his microscopes. According to some reports, Antonie is believed to have made over 200 microscopes that had various magnifications, but only a few of them survived. He also made over 500 optical lenses. He used copper or silver to make the frames for his microscopes. The lenses that have endured are able to magnify objects up to 275 times. In 1665 the great English scientist Robert Hooke released Micrographia, showcasing drawings he had made of the natural world seen through the lens of his microscope. Antonie visited England in 1668 and most likely saw a copy of Micrographia: it had become the first scientific bestseller. Importantly for Leeuwenhoek, it contained drawings Hooke had made of his microscopic examinations of cloth. Hooke himself did not use lenses made by this method because they were inconvenient: the distance between the lens and the viewed object had to be very short and the observer’s eye had to be pushed very close to the lens, causing Hooke’s eyes to quickly become strained. Hooke used a compound microscope (one with two lenses) which more closely resembles the microscopes we use today. 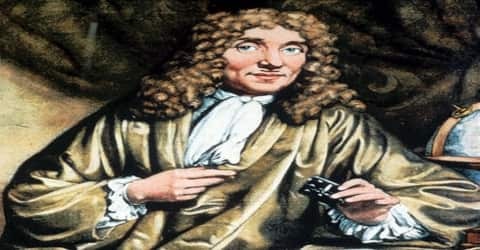 After developing his method for creating powerful lenses and applying them to the study of the microscopic world, van Leeuwenhoek introduced his work to his friend, the prominent Dutch physician Reinier de Graaf. When the Royal Society in London published the groundbreaking work of an Italian lensmaker in their journal Philosophical Transactions of the Royal Society, de Graaf wrote to the editor of the journal, Henry Oldenburg, with a ringing endorsement of van Leeuwenhoek’s microscopes which, he claimed, “far surpass those which we have hitherto seen”. In response, in 1673 the society published a letter from van Leeuwenhoek that included his microscopic observations on mold, bees, and lice. Although Leeuwenhoek’s studies lacked the organization of formal scientific research, his powers of careful observation enabled him to make discoveries of fundamental importance. In 1674 he likely observed protozoa for the first time and several years later bacteria. Those “very little animalcules” he was able to isolate from different sources, such as rainwater, pond, and well water, and the human mouth and intestine. He also calculated their sizes. In 1674, van Leeuwenhoek used his hand made microscopes to observe minuscule living objects in various water bodies, human gut. He dubbed these minute living beings as “very little animalcules”, and estimated their sizes. In 1676, his credibility was questioned when he sent the Royal Society a copy of his first observations of microscopic single-celled organisms. Previously, the existence of single-celled organisms was entirely unknown. Thus, even with his established reputation with the Royal Society as a reliable observer, his observations of microscopic life were initially met with some skepticism. In 1676 Leeuwenhoek discovered bacteria in the water. The bacteria were at the limit of observation of his microscope he estimated that it would take more than 10,000 of them to fill the volume of a small grain of sand. Such was the brilliance of his work that nobody else observed bacteria until another century had passed. in all falling rain, carried from gutters into water-butts, animalcules are to be found; and that in all kinds of water, standing in the open air, animalcules can turn up. For these animalcules can be carried over by the wind, along with the bits of dust floating in the air. Antonie then made important observations regarding the human eye, striated and non-striated muscle fibers and even studied insects and plant structures and asexual reproduction in aphids. He then studied unicellular organisms, in particular, yeast, and made significant observations regarding their composition in 1680. The same year he was granted a fellowship in the Royal Society of London. His discoveries were, for the most part, made public in the society’s Philosophical Transactions. The first representation of bacteria is to be found in a drawing by Leeuwenhoek in that publication in 1683. The eminent microbiologist also studied plaque formation in the human oral cavity in 1683. It is believed that he made these observations using his own teeth and even his own wife and daughter. In 1684, he studied the works of Marcello Malpighi’s demonstration of the blood capillaries. In continuation of Marcello’s works, Antonie studied the red blood cells and provided a fairly accurate description. Antonie’s researches on the life histories of various low forms of animal life were in opposition to the doctrine that they could be produced spontaneously or bred from corruption. Thus, he showed that the weevils of granaries (in his time commonly supposed to be bred from wheat as well as in it) are really grubs hatched from eggs deposited by winged insects. His letter on the flea, in which he not only described its structure but traced out the whole history of its metamorphosis, is of great interest, not so much for the exactness of his observations as for an illustration of his opposition to the spontaneous generation of many lower organisms, such as “this minute and despised creature.” Some theorists asserted that the flea was produced from sand, others from dust or the like, but Leeuwenhoek proved that it bred in the regular way of winged insects. Van Leeuwenhoek was visited by Leibniz, William III of Orange and his wife, Mary II of England, and the burgemeester (mayor) Johan Huydecoper of Amsterdam, the latter being very interested in collecting and growing plants for the Hortus Botanicus Amsterdam, and all gazed at the tiny creatures. In 1698, van Leeuwenhoek was invited to visit the Tsar Peter the Great on his boat. On this occasion van Leeuwenhoek presented the Tsar an “eel-viewer”, so Peter could study blood circulation whenever he wanted. In 1687, van Leeuwenhoek reported his research on the coffee bean. He roasted the bean, cut it into slices and saw a spongy interior. The bean was pressed, and oil appeared. He boiled the coffee with rainwater twice and set it aside. Like Robert Boyle and Nicolaas Hartsoeker, van Leeuwenhoek was interested in dried cochineal, trying to find out if the dye came from a berry or an insect. In 1702, while studying rotifers and nematodes Antonie made the observation that microorganisms or the animalcules can be propagated by wind, water, and air. 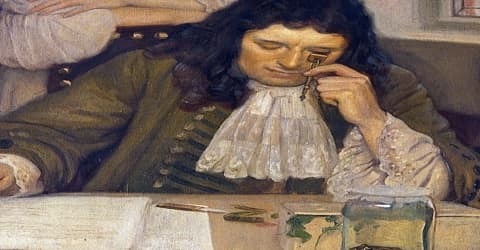 By the end of his life, van Leeuwenhoek had written approximately 560 letters to the Royal Society and other scientific institutions concerning his observations and discoveries. Even during the last weeks of his life, van Leeuwenhoek continued to send letters full of observations to London. The last few contained a precise description of his own illness. 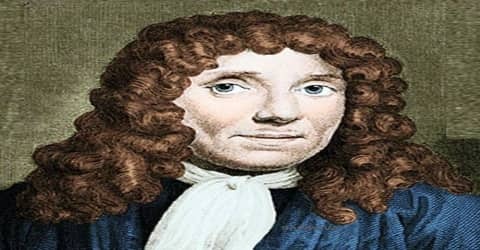 He suffered from a rare disease, an uncontrolled movement of the midriff, which now is named van Leeuwenhoek’s disease. This eminent scientist is referred to as the ‘Father of Microbiology’ and the Royal Society of London honored his contribution to the scientific world by granting him a fellowship. Antonie van Leeuwenhoek suffered from a rare disease, an uncontrolled movement of the midriff, which now is named van Leeuwenhoek’s disease. 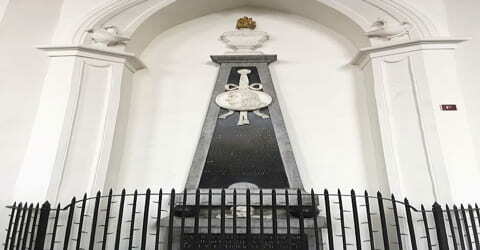 He died at the age of 90, on 26 August 1723, and was buried four days later in the Oude Kerk in Delft. He was survived by his daughter Maria, who had not married. She looked after her aging father and helped him to run the family’s textile business. Leeuwenhoek had become a wealthy man and Maria inherited this wealth. At the end of the 17th century, Leeuwenhoek had a monopoly on microscopic research and discovery. Over the years, he was visited by many prominent individuals, including Peter the Great, a Russian Czar. However, he would not show any of his cutting-edge microscopes to any of his notable guests, only letting them see average-quality lenses. His main discoveries include the infusoria, which are protists in today’s zoological classification, bacteria in 1674, the cell’s vacuole in 1676, spermatozoa in 1677 and the banded structure of muscular fibers in 1682. He also conducted research on the coffee bean and reported on it in 1687. Although Antonie had not been born into a scientific family nor had he received an education in science, his death was that of a true scientist. 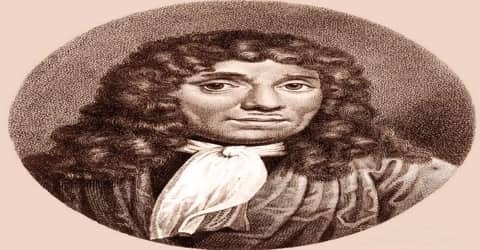 He communicated to the Royal Society such a careful, detailed description of the medical condition that was affecting him, eventually causing his death, that it is now called Van Leeuwenhoek’s disease. This is a rare condition which causes involuntary twitching of muscles. Antonie’s original specimens were archived by the Royal Society of London and in 1981 microscopist Brian J. Ford conducted a further study to expand Leeuwenhoek’s original works. His contributions to the Philosophical Transactions amounted to 375 and those to the Memoirs of the Paris Academy of Sciences to 27. Two collections of his works appeared during his life, one in Dutch (1685–1718) and the other in Latin (1715–22); a selection was translated by Samuel Hoole, The Select Works of A. van Leeuwenhoek (1798–1807).